JUNEAU, Alaska � All 11 people aboard a plane that recently crashed have been rescued in mountainous terrain on Prince of Wales Island in Alaska, officials said. A Coast Guard helicopter located the crash site and hoisted the pilot and passengers to safety, U.S. Coast Guard Petty Officer Charly Hengen said. "This could have been bad," she said. "Thankfully, it was a good outcome. Even though these people did sustain some injuries, we are very thankful that all are alive and that we were able to get to them quickly even with the weather conditions." The people were taken to a staging area with emergency personnel onsite. The Coast Guard, in a release, said all on board were reported to have received minor injuries but otherwise were in good condition. It provided no further detail on injuries. 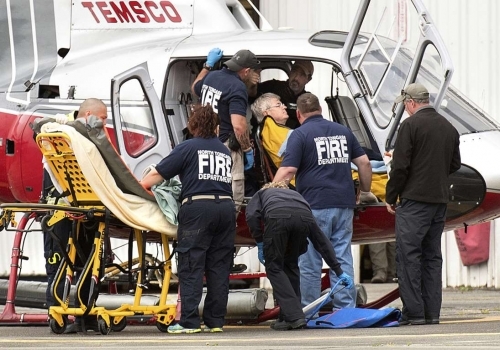 Mischa Chernick, a spokeswoman for PeaceHealth Ketchikan Medical Center, said all 11 individuals from the plane were brought to the hospital and being assessed. Hengen said there was roughly one-quarter mile of visibility as crews searched for the crash site about 40 miles (63 kilometres) southwest of Ketchikan. The downed aircraft had an emergency locator that aided rescue efforts. The crash site was located at an elevation of about 2,000 feet on the side of a mountain. A photo distributed by the Coast Guard shows a white plane with blue trim on rocky terrain. Clint Johnson of the National Transportation Safety Board in Alaska said the plane was a float-equipped de Havilland Otter aircraft. Taquan Air, which conducts scheduled flights and sightseeing services, said it was a chartered flight. The company said it had suspended all scheduled flights and was co-operating with authorities. "It is imperative we understand the factors surrounding this incident to prevent similar ones," the company said. Alaska State Troopers identified the pilot at 72-year-old Mike Hodgins of Ketchikan. Troopers said he reported the crash. The pilot was flying from Prince of Wales Island and bound for Ketchikan when the crash occurred, according to the Troopers. The heavily forested Prince of Wales Island near the southern tip of the Alaska Panhandle is the fourth-largest island in the U.S. At 2,577 square miles (6,675 square kilometres), it's larger than Delaware. Prince of Wales Island is part of the Tongass National Forest and home to a handful of small communities. Residents can travel to Ketchikan by ferry or scheduled commuter flights. � Copyright 2018 The Canadian Press.